SOMERVILLE -- Tufts and Brandeis engaged in a back-and-forth shoot-out for the first 30 minutes of their women's soccer contest on Kraft Field Tuesday, but the Jumbos would earn the victory on a goal by senior co-captain Martha Furtek (East Falmouth, MA) with just 100 seconds left on the clock. The win is the sixth straight for the Jumbos (7-1), who are the 17th ranked team in the country this week. The Judges lost for the second straight game and fell to 6-3-1 overall. Tufts set the tone for the first half when senior Lauren Fedore (East Lansing, MI) scored just 28 seconds into the match, chipping a low cross from sophomore Whitney Hardy (Truckee, CA) over the goalie. The hosts extended their lead to 2-0 less than five minutes later on sophomore Cara Cadigan�s (Nahant, MA) goal from Ali Maxwell (Exeter, NH). Brandeis stormed back with authority, as the duo of senior Tzlil Castel (Boston, MA) and first-year Tiffany Pacheco (Rehoboth, MA) combined on three straight goals in less than seven minutes. Castel scored all three and was assisted by Pacheco on each, including a header by Castel off a cross from the left side in the 23rd minute that put the Judges in the lead at 3-2. Cadigan struck again, her ninth goal of the season already, in the 31st minute when she kicked in a rebound off the post. The game went to halftime tied at 3-3. 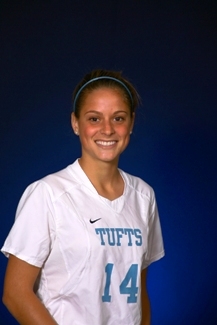 Tufts had a definite advantage in the second half, finishing with a 15-4 margin in shots and 5-0 on corners. Minutes before her game-winning goal, Furtek had a great opportunity that was saved by Brandeis keeper Hilary Rosenzweig (Boca Raton, FL). However, with 1:40 on the clock, Furtek place a shot from outside the 18 inside the left post to win it for the Jumbos. First-year goalkeeper Hannah Jacobs (Mill Valley, CA) earned the win for the Jumbos, entering in the second half and not allowing a goal while making three saves. Rosenzweig finished with eight saves for the Judges.